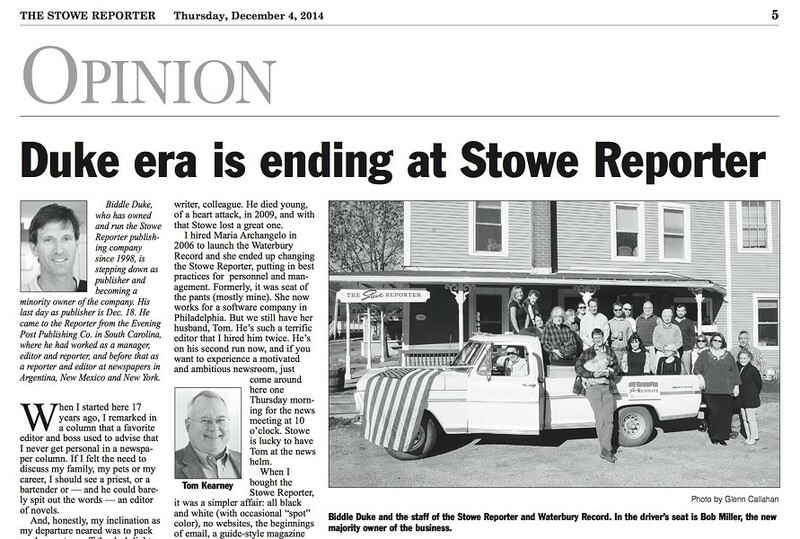 After 17 years at the Stowe Reporter, publisher Biddle Duke is stepping down and selling a majority stake in the paper and its sister publication, the Waterbury Record, to two out-of-state investors. Duke, who will remain a minority shareholder, announced the news in a column in Thursday's Reporter. His departure takes effect December 18. The sale will complete a process that formally began in October 2013, when Bob Miller and Norb Garrett bought a 49 percent stake in the papers. Miller, of New York, and Garrett, of California, own a trio of weekly newspapers in Southern California. Duke remained publisher at the time and his family remained majority owners. "I was looking for not only a financial exit, but also the right thing, because I think newspapers need to continue to thrive," he says. "Bob and I and Norb have spent the last 14 or 15 months feeling each other out. We've become great friends. They're great partners and it's been really great." Replacing Duke as publisher will be Greg Popa, who has worked on-and-off at the Reporter for decades. He currently edits the company's biannual Stowe Guide and Magazine and serves as the organization's sales manager. Tom Kearney, who returned to the papers as managing editor in June after a brief departure, will continue to lead the newsroom. "We intend to keep on doing what we've been doing," Miller says. "I think there's going to be no perceived change." Miller, a longtime executive at Time, Inc., and a former publisher of Sports Illustrated, has known Duke and his family for years. He and Garrett were already looking to expand their partnership when they learned two years ago that Duke was interested in moving on. "As we just started familiarizing ourselves with the business in Stowe, it became something we became really comfortable with," he says. "It just seemed like this is a great community, and I've become very comfortable with the community newspaper business, and it really seemed natural." Miller says he plans to be a hands-off owner, but will spend "a fair amount of time in Stowe" early next year to become more familiar with the paper and its staff. Neither he nor Duke would disclose the precise terms of the deal, which they expect to close later this year. Duke says he's not sure what he'll do next, but plans to stay in Stowe for the foreseeable future. "I'm looking around. I'm going to catch my breath for a month or a few weeks," he says. "I want to get back into journalism and reporting. I'm going to be a total opportunist and be doing things in Vermont and doing things nationally and peddling my skills." Duke says he originally hoped to find a Vermonter to buy the Reporter and the Record, the latter of which he founded in 2007, but he was most interested in finding an owner who shared his values. "I think I'd have reservations whether it was an in-state person or an out-of-state person," he says. "I'm filled with all kinds of emotions at the moment. I want these institutions — the Waterbury Record and the Stowe Reporter — to carry on and thrive. That's my main ambition."